No, you aren’t experiencing déjà vu. What you see here is Sony’s Xperia X Performance, the higher-end sibling of the Xperia X. It’s not a complete disappointment like its mid-range counterpart, but considering it only offers a minor performance upgrade, its $700 price tag should make you blind with rage. I’m not happy with where Sony is taking its Xperia X series. I was expecting a successful reboot of the terminated Xperia Z family, but instead we got a trio of underwhelming re-entries into the Android smartphone scene. The Xperia X Performance’s higher-end components and water resistance certainly make it the most appealing hardware option among the three Xperia X smartphones, but it’s hardly worthy of its flagship title. 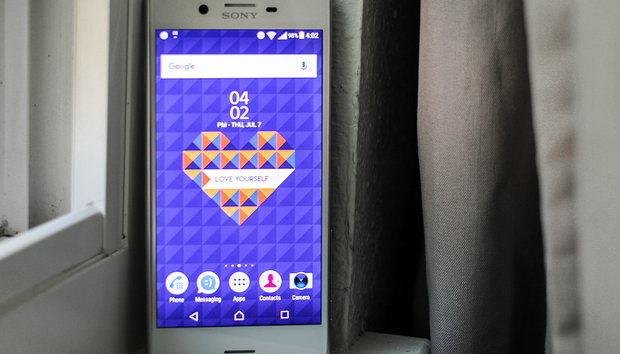 I can’t help but talk about how much I miss the Xperia Z series. Those phones were truly works of art, even with their quirks. They were light and thin, and came in a variety of fun colors. At their debut, they were some of the few Android smartphones that could even remotely compete with Apple’s iPhone. ...but its backside tells a different story. Conversely, the Xperia X Performance feels too cheap to be a marquee Sony device. It has Sony’s sharp edges and unibody design, but it’s covered in a weird mixture of thick, tempered glass on the front, and weirdly unimpressive aluminum on the back. Sony probably would have been better served by co-opting Samsung’s design choices, and covering the entire thing in glass. The Xperia X Performance features a volume rocker and a quick-launch camera button, which also works as a shutter button underwater. A slot on the left side opens up to a SIM and microSD tray. The Xperia X Performance employs a microUSB port rather than the new USB Type-C standard. The Xperia X Performance is water- and dust-resistant, but not particularly durable: I chipped the corner of the phone after accidentally dropping it while walking to my car. Granted, Sony’s Xperia Zs weren’t exactly the most durable smartphones either (remember when I dropped the Xperia Z Ultra?). But at least those Z phones weren’t so thick that I’d mind putting a case on them. To wit: The Xperia X Performance is a chunky 8.7 mm thick compared to the Xperia Z5’s 7.3 mm thickness (granted, the Z5 never actually made it to the U.S.). The Xperia X Performance’s 5-inch 1080p IPS LCD display is also somewhat disappointing. It’s over-saturated, but not in a good way like Samsung’s Super AMOLED technology. Bright colors appear slightly blown out, which is especially noticeable in apps that follow Android’s Material Design guidelines. But if nothing else, the X Performance’s display can get very bright, which is nice when you need to use the phone in glaring summer sunlight. Unlike the Xperia X, which uses the mid-range Snapdragon 650 processor, the Xperia X Performance uses Qualcomm’s latest high-end chip, the Snapdragon 820. It’s the same chip that’s inside all of its competitors, including the Galaxy S7, HTC 10, and LG G5. Sony’s Xperia X Performance tested rather well in day-to-day tasks like browsing the web and switching between apps. Like to play games? The Xperia X Performance is capable, but the Galaxy S7 beat it slightly in 3DMark. The Xperia X Performance performed as expected alongside the rest of the flagship lineup in our benchmark tests. In PCMark, which tests pedestrian tasks like browsing the web and editing documents, the phone actually performed better than the competition, despite boasting the same 3GB of RAM included in all the other phones. However, 3DMark results came in short of the competition, despite Sony using the same chip. Regardless, no app stuttered during my own day-to-day testing. The Xperia X Performance’s battery life was incredibly disappointing. The Xperia X Performance’s battery results were disappointing—especially considering this higher-end model has a slightly larger battery than the mid-range Xperia X. In our Geekbench battery rundown test, the phone’s 2700mAh battery died nearly two hours earlier than the Galaxy S7’s slightly larger 3000mAh battery. Even the Xperia X, which uses an incrementally smaller 2620mAh battery, outlasted the so-called “Performance” model. The Xperia X Performance fared just a bad in PCMark's battery test. The results were a bit surprising considering the stellar battery life I experienced with the device on standby. The Xperia X Performance’s 23-megapixel camera pairs better with the device’s Snapdragon 820 processor. Like the mid-range Xperia X, the Xperia X Performance features a 23-megapixel rear-facing camera with an aperture of f/2.0. Lke its sibling, the phone shoots with 8-megapixels on the rear by default, so you’ll have to go in and change that before you start snapping away. There’s also a 13-megapixel front-facing camera. A shot from New York City’s High Line. Notice the extreme overexposure toward the top of the photo because of the glare off of the glass buildings. The Xperia X Performance produced an OK shot during a dreary day, though a little more contrast could have helped it pop. These flowers were especially vibrant in real life... but not so much here. Again, notice how overexposed the sky is. I was really hoping for better low light performance, but alas. There’s not much difference in camera performance between the Xperia X and Xperia X Performance. I was disappointed with the photos produced by the mid-range Xperia X during testing, so, for a recent trip, I brought along an extra phone in case the Xperia X Performance starting failing me as well. But, thankfully, Sony’s higher-end model was good enough. The Performance’s processor bump helped the camera app run more smoothly, and the phone didn’t shoot blurry, glitchy photos like the Xperia X. Even in our lab test, you can see the Xperia X Performance’s propensity to over expose in bright light. The Xperia X Performance is decent in low light as long as you can hold the phone perfectly still. Here it’s buckled in to a tripod. Still, you’ll have to contend with Sony’s awful, bloated camera apps, weird augmented reality add-ons, and limited manual mode. If you’re really considering this phone for whatever reason, I suggest going third-party with the camera app, too. I’ve even put together some suggestions! What is up with these ads? The Xperia X Performance’s interface is simple enough, but far from what I’d call a near-stock Android experience. The Xperia X Performance runs the latest version of Android Marshmallow 6.0.1 with Sony’s own user interface on top. But like the Xperia X, it has a number of ridiculous “recommended applications” taking up space in the app drawer. You can easily ditch these by installing another launcher or by throwing your phone out the window, though I’d caution strongly against the latter choice, considering the cost of the phone. The mere existence of this is agravating. In all seriousness, I’m bummed that the Xperia X Performance doesn’t run the simple Marshmallow interface that Sony teased late last year. Hopefully, Sony will get rid of this weird interface add-on in a future software update. Is this your next phone? Only if Sony reduces the price by at least $200. I’ll never stop mourning the death of the Xperia Z series, especially because I don’t see the Xperia X series picking up where those phones left off. I like some aspects of the Xperia X Performance, like its water resistance, its speedy processor, and the fact that it’s a really comfortable phone to use. But I can’t call it a premium device because it simply doesn’t feel like one. It’s not worthy of flagship status, either, and I suspect Sony will have to try really, really hard to convince the public that it’s worth an exorbitant $700. All that said, this is still the only Xperia X variant worth even considering. So, if you’re really aching to get a Sony device back into your hands, wait until the company gets the hint—like it did with the Xperia X— and drops the price by about $200.